A health worker demonstrates how to use various gadgets during the male medical circumcision operation (file photo). 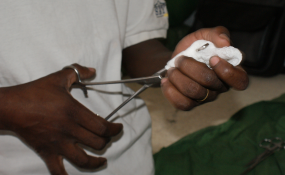 The County Government of Bungoma has put in place strict guidelines for traditional circumcisers ahead of the ritual scheduled to kick off early next month. A total of 3, 000 boys are expected to undergo the initiation in Bungoma County during the August and December school holidays. The County Director of Culture, Ms Alice Wafula, said that the traditional circumcisers are required to be members of a well-known Sub - County clan for them to be registered officially by the County Government. The registration of circumcisers is renewed each circumcision year for one to be allowed to perform the initiation rite. "The County government is yet to award renewal certificates to the circumcisers this year. We will do so after a training workshop that will take place on July 25 before we officially launch the circumcision period," said Ms Wafula. Ms Wafula further noted that one circumcision knife will be used per child to curb the spread of infectious diseases such as HIV/AIDS. She said that for one to qualify to be a circumciser, he ought to be 35 years of age and above adding that his first born child must be a boy. The devolved unit also expects the circumciser to be of good morals and have undergone traditional rituals conducted by the Bukusu elders and must also test negative to HIV/AIDS. "Before the circumciser can officially start the exercise, he must slaughter a goat and offer it as a sacrifice to appease the ancestors and his age mates so that they can allow him to perform the exercise well," said Ms Wafula. "Any circumciser who doesn't adhere to the stipulated measures will be banned by the county government from performing the practice for a number of years."